Return of the "Hugging Saint"
The "hugging saint" spreading love in Alexandria in 2010. Thousands of devotees are expected today in Reston, Virginia, to worship a woman's feet, and then, hopefully, get a hug. Indian spiritual leader Amma, nicknamed the Hugging Saint, has traveled the world giving millions of hugs to transmit what she calls the "purest form of love." She returns to Virginia on Wednesday for two days of spiritual congregation, and of course, a lot of embraces. In her visit last year, 10,000 came out to see Amma at the Hilton Mark Center in Alexandria. Visitors first performed a ritual worship of the holy woman's feet, and then they waited for several hours to get a long, tender embrace from the 58-year-old. 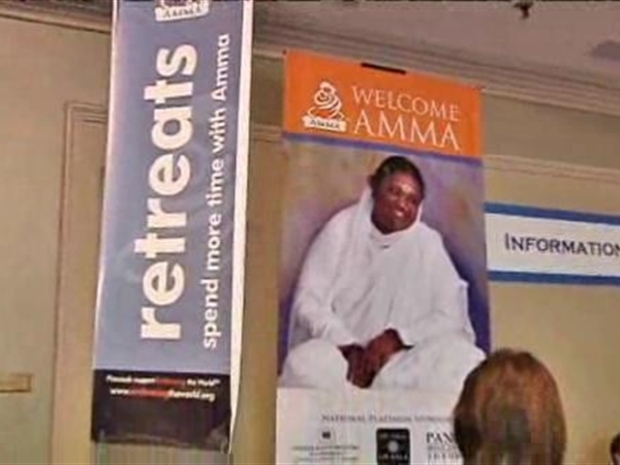 Amma's hug-in started at the Hyatt Regency Reston Hotel at 10 a.m. on Wednesday, and will run until 7 p.m. She will keep the same hours on Thursday. The event is free, although visitors can purchase goods from concessions that will go towards charities for the poor. Meditation classes will also be offered. Thousands of people gathered in Alexandria, Va., to meet the "hugging saint." More information on Amma at her site here.